The church of the Holy Innocents In New York City will have a Lenten Parish Mission from Monday March 19 to Wednesday, March 21, during the 6 pm Latin Mass, to be preached by Fr Joseph Tuscan, OFM Cap. There will be the opportunity, for all those who attend each evening of the Mission, to gain a Plenary Indulgence. Confessions will be heard after Holy Mass. 1) Monday – Blessed Solanus Casey; overcoming patterns of personal sin and healing of division. 2) Tuesday – Saint Padre Pio; forgiveness and healing in families and the sacrament of reconciliation. 3) Wednesday – The Blessed Virgin Mary and the Holy Eucharist (with special blessing to impart the plenary indulgence). Fr. Joseph entered Borromeo College Seminary in 1986 where he earned his Bachelor’s degree in Behavioral Sciences in 1989. In 1990, he professed his first vows as a Capuchin friar, and perpetual vows in 1993, going on to earn his Master’s degree in Theology at the Washington Theological Union in 1995; he was ordained to the priesthood in 1997. His first assignment after ordination was on the Pacific island of Papua New Guinea, where he served for four years. Since returning to the US in 2001, he has served in various capacities as parochial vicar, military and hospital chaplain, and Pastor. 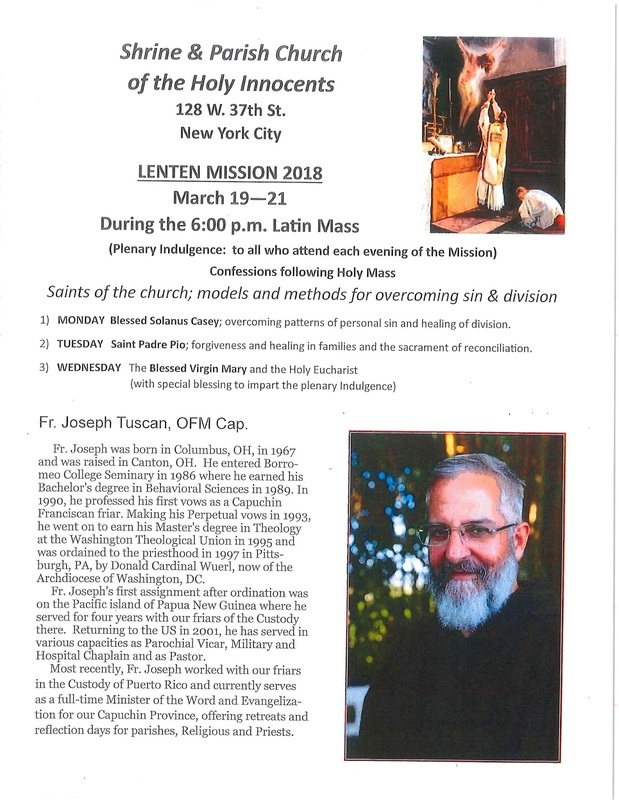 Most recently, he worked with the friars in the Custody of Puerto Rico and currently serves as a full-time Minister of the Word and Evangelization, offering retreats and reflection days for parishes, religious and priests. What is the point of a parish mission? Are parish missions necessary? Who benefits from parish missions? A mission is an opportunity for a parish to experience in a heightened and intense way spiritual services, sermons, and Sacraments focusing on the major themes of our Faith. We all know of parishes where we can find people who habitually neglect Mass on Sunday and on feasts of obligation, even though they could go without any difficulty. Such people, if they go to their annual confession, manifest some kind of sorrow when questioned about this point, and promise to amend. Yet, after having attended Mass twice or three times, miss it again the same as before. Next year they make the same promises, and the same relapses follow. In these cases, only the plain (but forcible) exposition of the evil of sin and its terrible consequences on the one hand, and the reflection on the mercy and goodness of God on the other, made by experienced missionaries who have experience in dealing with such cases, can make an irresistible impression upon their perverted hearts. Only a good parish mission may be able to bring these souls back to God. The benefits that grow from parish missions in Christ’s vineyard cannot easily be overestimated. Parish missions are times of extraordinary grace in which the kingdom of God is re-established in the hearts of the faithful, sinners are restored to God’s friendship, tepid souls are re-animated to a life of fervor, and the righteous are encouraged in their efforts to aim at still greater perfection. In a word, a mission well-made destroys the kingdom of Satan, purifies and renovates the parish, and glorifies the Church of God. With good parish missions, the better portion of the parishioners are strengthened in their faith; they learn to appreciate their religion in greater measure and to practice it more cheerfully; and they are put on their guard against dangers that threaten them at the present, or may rise up against them in the future. The weaker portion of the congregation is animated to greater fervor; the wayward are brought back; the erring are enlightened; the ignorant are instructed; and all classes of sinners are brought to repentance and to true reconciliation with God and His Church.